Happy Tuesday, Everyone! Deb is on her way back from SXSW, and I’m sure she found it a valuable and enjoyable experience. Did anyone else find that they were a bit “off” yesterday? I blame the time change. Here are your leads for today. Hope you find something interesting on the list. Do you follow FWJ on Facebook? Is Your Freelance Marketing Message Clear? Any Good Content Writers Out There? 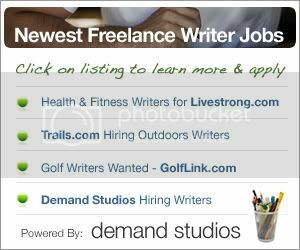 Just to let you know, the Writer for Web and Advertising and Marketing Pieces is the Freelance Home Writers where you have to pay to join.